For starters, the Boomer generation is notable not only for its size in numbers, but also for the length of time it spans. The population tidal wave that rolled across America, as well as many other countries around the world following World War II, lasted an unprecedented 18 years. By comparison, the generation of Ikes/Silents (those born 1932 to 1945) that preceded Boomers only spans 13 years; while the generation that followed, GenX (born 1965 to 1979) clocks in at 14 years. To get a handle on the implications of their lengthy 18-year span, it is helpful to think of the Baby Boomer generation as spread across a continuum of ages and influences, held together by a common thread of values. At one pole are what we refer to as “Leading-Edge Boomers,” individuals born between 1946 and 1954, the older segment of the demographic who were entering their 60s in 2006. At the other end of the continuum are the “Trailing-Edge Boomers,” born in the years between 1955 and 1964 including women still in their early 40s (see Figure 2-1). The informed marketer can safely make certain broad-stroke assumptions about the motivations, needs, and interests of Leading-versus Trailing-Edge Boomers. There are, after all, certain biological and age-related realities with which even the most resourceful Baby Boomer woman will be forced to contend at a certain age or stage of her life. The woman at 40, for instance, is more likely than a 60-year old to be juggling the demands of school-aged children who are still living at home while she is simultaneously building her career. On the other hand, the woman at 60 is likely to be more concerned with being the caretaker for her parents while dealing with the imminent financial ramifications of retirement, than is the woman in her 40s. 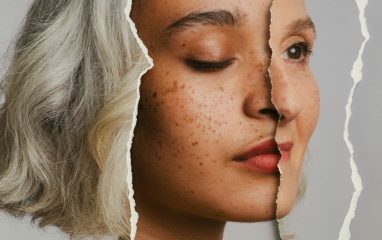 And a woman in her late 40s and 50s, even after her facelift makes her look fifteen years younger, will still have to make decisions about how to deal with the physical challenges of menopause related to her true chronological age. Common sense dictates that it is possible to make certain age and life stage assumptions about marketing to the Baby Boomer woman. But be forewarned, this is only a preliminary step in truly understanding who she is—and how to market to her. A major flaw in most targeted marketing campaigns is that the campaign is not “targeted” at all, but rather generalized to the point that it only reflects a stereotype about that particular segment of the population. Take the case of marketing-to-moms—the trend that took hold around the turn of the 21st century. But just who is this “Mom” that marketers are targeting? Is she only the young woman in the pastel-colored advertisement cradling her newborn? Is she the quirky “Desperate Housewife” in her 40s, chasing around two young boys after a full day at work (or her husband or the gardener in her spare time)? Could she even be the “empty nest” woman in her 50s or 60s, more engaged than she’d ever suspected in the life of her adult offspring and grandchildren? Stereotypes of motherhood aside, she, too, often continues to think of herself as “Mom.” As many marketers have been finding out, there is no singular target called “moms,” only a person called “Mom,” in her many roles and guises. Similarly, when marketers talk about targeting the Baby Boomer woman, are they only thinking about the long-married female, entrenched in her relationships and ways of being in the world? Or are they also thinking of the possibility of a widow, “single and loving it,” a self-chosen divorcee, or even a blushing bride? Once we leave the relatively safe perch of biological markers, marketers are on fresh, new, and largely unexplored demographic terrain. The fact is that age and even physical milestones are not the most reliable indicators of either her needs, or what it is that makes her tick. To continue the process of getting to know her in all her glorious complexity, we must turn next to understanding her generational influencers. Every generation holds beliefs and ideals that were shaped by the key historic, social, economic, and political events of their formative years. A unique convergence of core influences shapes each generation as a distinct demographic in its own right, with its own special tone and flavor. Some of the key qualities and characteristics at the heart of the Baby Boomer generation, pertaining to both men and women, are an orientation towards idealism, a preference for individualism, and a tendency towards immediate gratification. 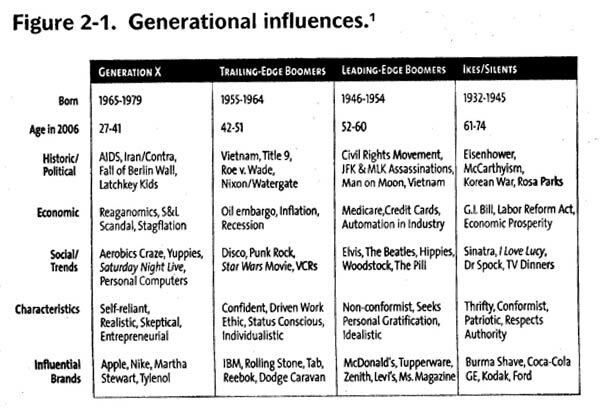 Figure 2-1 summarizes differing influences and characteristics acting upon the generations in the United States. These influencers are critically important for the marketer to take into consideration when strategizing about product and services attributes, marketing messages, and approaches. The experiences, events and cultural revolution of the 1960s and 1970s had a dramatic effect on the Baby Boomer generation’s perception of the world; they emerged with a much more dynamic relationship to global events, they had the confidence to challenge authority, and saw that they had the power to effect change. They embraced the concepts of individuality and creativity, and rallied against excess; they were turned on by music, art, and politics that celebrated peace and love and a better world. Their experiences gave them very different expectations for their futures, and for their roles and responsibilities in the world. They engaged actively in the workplace and achieved much greater autonomy in choosing lifestyles that expressed their individual choices. They were passionate about enhancing the quality of their lives. At Garnet Hill, we are passionate about providing great product offerings that bring both aesthetic and practical fulfillment to people’s lives. There are many elements of our brand and lifestyle approach that create a natural affinity to Baby Boomer women. For instance, we design with an eye to beauty and creativity first, balanced by comfort and practicality. It is rooted in the quality of natural fibers, supported by original artwork and executed with attention to detail. Casual and classic, it appeals to a broad age range. It is a tasteful product with a twist that makes you feel good when you wear it. Inspired by the colors, textures and diversity of our world-wide travel as well as our immediate surroundings, it has its own point of view. We support our merchandise with simple, yet sophisticated, creative presentations that also illustrate our commitment to aesthetics as well as quality. Our models have an attainable, friendly beauty and positive energy. They are styled and accessorized in unexpected, interesting ways. Our copy is intelligent and informative. These are very critical elements in clarifying and enhancing our brand. 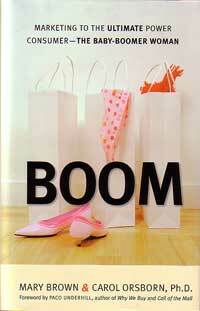 Baby Boomer women understand and relate to the values and lifestyle that our product and presentation convey. This may be in part because Garnet Hill’s original culture emerged as a result of the values of that generation. The catalog still represents and celebrates many of those aspirations—individuality, creativity, intelligence, comfort, quality, fulfillment, and simplicity. It comes across as a special and carefully edited collection. Although not inexpensive, our merchandise is perceived as having fair and lasting value for its price. Our customers appreciate the uniqueness and exclusivity of our product and view it as another way to express their individuality. The appeal is not about a particular age, but about creative, lifestyle-enhancing choices that transcend age. Joanne Sachse Mogren is vice president of apparel merchandising at Garnet Hill, Inc., a 29-year-old direct mail order catalog specializing in natural fiber apparel and home furnishings, in Franconia, New Hampshire. She joined Garnet Hill in 1982, and currently oversees the merchandising, design and product development for both Garnet Hill and Growing Up with Garnet Hill, their spin-off children’s title. For a Trailing-Edge Boomer, idealism is still the ticket. However, for her, the emphasis shifts subtly from non-conformity to individualism, with an overlay of status consciousness thrown in for good measure. Napa Auto Care Center gets it right for her with an ad that is summarized by the tagline: “Get the Good Life.” The print ad for the auto care company features a typical Trailing-Edge mom’s spontaneous hodgepodge of magnets and personal messages scattered over the front of her high-end stainless steel refrigerator. The overriding vision is one of a mom who is giving her all to parenting at its finest. But this woman is not only living up to the ideals of her generation, but raises them. For in addition to the trendy refrigerator that confers status upon her, she has obviously won bragging rights through the endless activities with which she has involved her children: swim lessons, dance class, baseball practice, and piano lessons, among them. And don’t feel that you’ve got to show a man walking on the moon or hit every generational bell and whistle to connect with her. In fact, if the nostalgic card is played too blatantly, it can come across as gratuitous. She will have her antennae up for any note that resonates as disingenuous. As “purveyors of the practical and hard to find,” The Vermont Country Store brings back forgotten items that hold memories of days past. After conducting studies, we identified that we have two core groups of customers: WWII/Depression Era and Baby Boomer cohorts. However, we found that the approach we take in our core catalog, using black and white illustrations and imagery and no-frill layouts, didn’t connect with our growing Baby Boomer segment. Armed with this knowledge, we set out to market to this customer segment differently than the older cohort. We launched a color catalog and wrote unique copy aiming to “speak” to them more relevantly. Great idea, but this approach wasn’t enough for savvy Boomers. There was no overt indication that we were introducing something new and particularly relevant to them. Since then, we have applied our knowledge to getting it right for Boomers, and Boomer women in particular. We’ve focused on a product assortment that is more relevant to this younger demographic, and in particular, the Leading-Edge Boomers. Products like Tangee Lipstick, Lanz Tyrolean flannel nightgowns, and Caroler Candles strike a chord. We don’t present them with the more practical products geared toward senior living because they don’t want to be reminded of the health implications of aging. And they certainly don’t feel the need to be too prepared for that stage of life. Cindy Marshall has over twenty years of traditional direct marketing experience. Currently, she serves as director of marketing for The Vermont Country Store where she is responsible for catalog and ecommerce marketing efforts. Previously, Cindy was vice president of marketing for Ross-Simons and vice president of marketing at eZiba.com. Cindy also enjoyed four years at L.L. Bean where she was part of the management team that launched Freeport Studio, a women’s apparel brand targeted to Boomer women. Additionally, Cindy held the position of L.L. Bean Visa Loyalty marketing manager. Her extensive background also includes senior management positions at J.Jill, Appleseed’s, and Inc. magazine. Some companies who have used iconic songs from the 60s or 70s to sell their products or services can attest to this first-hand: Baby Boomer women have been known to express outrage at what they think of as the too-conspicuously obvious manipulation of their emotions. While it is true, for example, that some Boomers (probably more men than women) enjoyed seeing Bob Dylan hawking women’s lingerie, there were other Boomers (probably more women than men) who felt that putting Dylan in an overtly commercial context, particularly one that could be seen as objectifying women as sexual objects, was degrading and even sacrilegious. While nostalgia generally appeals to her, the Baby Boomer woman wants her roots and memories honored—not exploited. Unless nostalgia is well done, stereotypical references to the peace and love generation, and the like, will only make the Boomer woman feel misunderstood, and even angry. An alternative, with less downside risk, is to let your message be informed by her values. An example of this is Olay’s, “Love the skin you’re in;ot” campaign. In one striking magazine ad for an anti-aging, anti-blemish moisturizer, the headline reads: “Wrinkles and pimples. What’s next, bifocals and ripped jeans?” The photo shows an attractive 40- or perhaps even 50-something woman, laugh lines having evaded the art director’s touch-up pen, peering over her hip reading glasses and looking very at-home in embroidered jeans with obvious holes at the knees. The frayed jeans are not only items of nostalgia from her distant past, but also something she is very likely to be wearing today, as well as tomorrow for that matter. The embroidered symbols on her jeans, hand-crocheted flowers in the style popular in the 1960s, are a subtle and perhaps even subconscious appeal to the iconography of her own history. 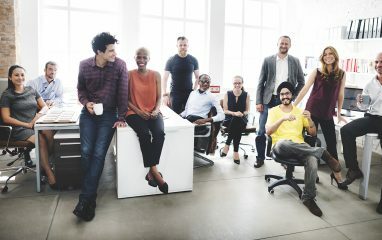 When it comes to core values, it is important to note that in many ways, Leading-Edge and Trailing-Edge Boomers have more in common with one another than they do with the women of either the Ikes/Silents or Gen X. But differentiating the Baby Boomer woman from the general population of women is only one more stop along the way to truly understanding what she wants and how to market to her. Pausing briefly to catch our breath, we are about to forge ahead to the next complicating factor. For not only does the Baby Boomer woman differ from the women of other generations, but she also differs from the men of her own let alone other generations. Having worked for a company that markets heavily to women (Konica) and one that markets heavily to men (DeLorme), I’ve figured out the essential difference: Men are more interested in how things work than in actual benefits/outcomes. Women are interested in benefits and resent the amount of time men have to waste in understanding how things work! The differences first became obvious to me in the mid-1990s, observing men and women in focus groups discussing the new digital cameras. The men wanted to know how the pictures were captured, what kind of CMOS (Complimentary Metal Oxide Semiconductor) chipset was included. The women really only became interested when they began to brainstorm how easy sharing pictures over the Web might be. The men . . . sharing? You must be joking. Caleb Mason is director of corporate marketing for the leading digital mapping and GPS innovator. After serving at Little, Brown and as VP/associate publisher at publishing start-up Salem House, he joined Konica. 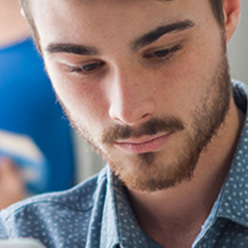 At Konica, Caleb was instrumental in launching new digital imaging products and services, including the world’s first large-scale consumer online photo service. Simply put, men and women are wired differently. He prefers the big picture and broad strokes, using a more linear and logical approach to making decisions. Her decision-making process, on the other hand, takes a layered and cyclical path, where subtlety, details, research, and word-of-mouth play influential roles. Marketers who have championed the marketing-to-woman trend referred to in Chapter One have, by now, teased out virtually every nuance regarding the differences between the purchasing styles and patterns of men and women in general. We will resist the temptation to recreate the entire body of knowledge that is readily accessed through such texts as Don’t Think Pink: What Really Makes Women Buy—and How to Increase Your Share of This Crucial Market by Lisa Johnson and Andrea Learned, and Marketing to Women: How to Understand, Reach, and Increase Your Share of the World’s Largest Market Segment by Martha Barletta. (For a more comprehensive list of gender and generational resources, see the Resources section at the back of the book.) In Chapter Five, however, we will take a deeper dive into the differences between men and women as it pertains, more particularly, to the Baby Boomer generation. At that time, we, along with a number of our contributing authors, will give the marketer specific guidance on how to capitalize on her unique purchasing behaviors and characteristics. The important thing to keep in mind at this juncture is the level of sophistication regarding gender marketing that is necessary to connect effectively with her. In other words, as Fran Philip of L.L. Bean warns, resist the urge to “just shrink it and pink it,” and you’re part way there. Over the past decade, women in their mid-forties and older have emerged as a powerful consumer: influential, smart, and savvy. Despite this, the Baby Boomer woman remains very underserved in the market, and to some degree annoyed about it. L.L. Bean, as a leading multichannel merchant of casual and active clothing and outdoor equipment, views her as a formidable opportunity and feels she deserves a lot of respect. Seventy percent of our customers are women, most are 45 to 55 years old, college-educated, with grown children and a career. These women are likely also driving the decision-making process on what the other 30 percent of our customers are purchasing. The Baby Boomer woman, more than any generation before her, knows her own power and doesn’t want to be taken lightly or marketed to in a disingenuous way. She’s too experienced for that. She’s a price-conscious shopper, not because she isn’t well-off, but because she’s smart and looking for value. We know she’s multitasking and has a very complex, time-starved life. So, as a brand, we ask: How do we solve problems for her? How do we make things more convenient for her? How do we make life easier for her? Whether we’re thinking about a marketing campaign, a catalog layout, or the thought process that goes into the development of a specific product, it’s all about building those qualities into the experience: the problem-solving, the practical, the functional, the comfortable, and the convenience. One of our biggest growth areas right now is in developing sporting equipment specifically for her. This doesn’t mean just taking a man’s backpack, cutting it down in size and offering it in more feminine colors—what’s known in the industry as “shrink it and pink it.” L.L. Bean has made a commitment not to take that approach. For example, we created a new pack about a year ago called the Celia Day Pack. Our development team worked extensively with product and field testers to try out all the women’s packs currently on the market. They highlighted what features they liked and eliminated what they did not like. Then we mixed and matched all these features and built a totally new pack from the ground up. It’s got everything she wants: it’s proportioned for her frame, is adjustable (because women come in lots of different sizes), and it comes in a variety of colors. The pack was an immediate success. This first women’s-only pack became our best-selling product of all the backpacks we offer, including men’s. We did the same thing for a kayak we’re introducing in spring called the Calypso kayak. The number one thing women told us they worry about in a kayak is weight. They want to be able to carry it and put it on top of their car by themselves. Fiberglass kayaks are extremely lightweight, but also fragile and expensive. We found a material both lightweight and durable, at her price-point. Also, the shape and size of the seat and cockpit are proportioned for a woman’s body instead of a man’s. L.L. Bean strives to build a lot of integrity into our products from the ground up, specifically for the 50-year-old female Baby Boomer. Whether it’s daypacks, kayaks, snowshoes, luggage, active wear, or casual apparel, if all you’re doing is addressing superficialities, she’ll find you out. Get the product attributes and pricing right for her first—and then you can worry about whether to make it robin’s egg blue, neon green, or yes, even pink. Fran Philip, before assuming her current position, served as senior vice president/general manager for two of L.L. Bean’s seven strategic business units: L.L. Bean Home and Freeport Studio. During her tenure, the Home Division has been one of the fastest growing and most profitable divisions of L.L. Bean. Before coming to L.L. Bean, Fran was one of the original founders of Calyx & Corolla, an innovative direct mail concept specializing in fresh flowers shipped directly to the consumer from the grower via Federal Express. Prior to Calyx & Corolla, Fran held positions at Williams-Sonoma, the Nature Company, and the Gap. Adding yet another layer of complexity, we turn to the fact that out of the 78 million Boomers living in the United States, one in three belongs to a racial or ethnic minority. These include 9.1 million African Americans, 8 million Hispanics, 3 million Asians, and 6 million who are multiracial.2 African-American, Hispanic, and Asian-American cultures are not homogenous, and neither are the Baby Boomer women of these cultures. They will tune out messages that fail to recognize the values, vocabulary, and insider humor that exist in their distinct cultural markets. Pepper Miller shares her intelligence with us regarding her particular area of expertise on this important point. African-American Boomer females represent a powerful, desirable, and distinctive consumer group. Not only do Black females overall control $403 billion in buying power, but they also are the means for reaching the Black market in general. The appropriate marketing investments must be made, and relevant messages must be created, that celebrate their decision-making power, individuality, style, and success. This call for relevance to this distinctive consumer is a departure from the mindset in marketing today that focuses on appealing to lifestyle similarities among various demographic segments. Rather than develop relevant communications targeted toward individual groups, the theory is that this “multicultural” approach will appeal to all audiences across the board. Recognizing the key cultural differences between African-American women and their White female counterparts makes all the difference in determining whether marketing programs and communications are relevant to African-American women. African-American females are on average educated, motivated, and visible in all aspects of society. Whether single or married, Black females are even more likely than White females to control the purse strings in their households. Furthermore, African-American women have always pushed the envelope of fashion trends and have made a tremendous impact on hairstyles and hair color. As a result, they continue to reject the general market beauty standards and embrace their own style and body image. 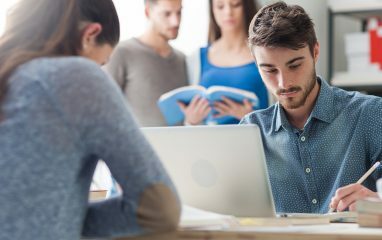 This behavior has motivated the fashion and marketing industries to take heed, learn, and incorporate these ideas into their product lines and marketing plans. The 2005 Window on Our Women study (WOWII), the first ever segmentation study on African-American women commissioned by Essence magazine and conducted independently by Lieberman Research Worldwide and The Hunter-Miller Group, details how Black women are a distinctive and desirable segment in the areas of fashion, media, retailing, and finance. While the study encompasses findings from Black women age 18 to 64, for purposes of this book the following findings are specific to comparing African-American female Boomers to their Caucasian female Boomer counterparts. Black female Boomers are more likely than White female Boomers to be the primary decision makers for their household’s travel, home electronics, financial services and investments, insurance, automobile, and real estate purchases. When surveyed about career and education decisions, more African-American females than their White counterparts believe that they must do work they enjoy in order to be successful. In addition, Black women are more likely than White females to say that they have overcome barriers and obstacles in their life, and indicate that they have more confidence in themselves and in their physical appearance. Thus, self-reliance is important to African-American women as 53 percent deem they must manage their responsibilities with peace of mind in order to be successful, as compared to 40 percent of White females. Lastly, compared to White females, Black females are four times more likely to see cultural heritage as a benchmark for success. Thus, 53 percent of African-American women feel they must stay true to their cultural heritage in order to be successful, as compared to 13 percent of White females. These Black women are readily reached using targeted media and through grassroots efforts in churches, Black organizations, and the community. Black women use general market media, but they embrace Black media. For example, of Black women who rely on magazines as a source of information, 70 percent rely solely on African-American magazines, while only 5 percent rely on general market magazines. Marketers hoping to reach and sell to African-American women need to note their differences from White females and, therefore, target and service these women differently. Pepper Miller is coauthor of What’s Black About It? Insights to Increase Your Share of the Changing African-American Market (Paramount Market Publishing, www.paramountbooks.com). She is president of The Hunter-Miller Group, Inc., a Chicago-based market research and planning firm that helps Fortune 500 companies understand and effectively market their products and services to African-American consumers. Isabel Valdés, Hispanic marketing expert, discusses unique marketing challenges and opportunities inherent in the Hispanic marketplace. One of the biggest differences between Caucasian and Hispanic Boomers in the United States is that the vast majority of Hispanics of this generation were born outside the United States. They emigrated from Mexico, Central and South America, Cuba, and Puerto Rico. They spent their core formative years in the traditional culture of their country of origin, that is to say, “Hispanic.” On average, they have lived in the United States about half of their lives, unlike younger Hispanic generations who, having lived from childhood in the United States, have more fully assimilated into mainstream American culture and lifestyle. Hispanic Boomers are usually caught between two cultures. And being older does increase the challenge to integrate into American systems and lifestyle. For instance, though the “empty nest” phenomenon is challenging and emotionally charged for many Boomer moms, it is doubly difficult for the Hispanic mom. Unlike their Anglo-American counterpart, who probably left home for college right after high school, Boomer Hispanic women were not so independent, remaining at home until marriage. Lacking a similar experience of their own, it is harder to reconcile their children’s—especially their daughters’—departure into the world. In fact, in some instances, Hispanic daughters are discouraged to go away to college by their families because it breaks with the traditional model of living with the parents, not by themselves. Latino Boomer women tend to put family above all else, sacrificing in the extreme for their husbands, kids, parents and extended relations. This Hispanic woman will respond to messaging, services, and products that speak to her sense of duty to keep family bonds strong. Not surprisingly, Latino Boomers are very involved with their grandchildren and aging parents. For Hispanic Boomer women, it is a given that every vacation, as long as her parents and in-laws are alive, involves multiple generations. Many juggle the logistics of caring for aging parents who in many cases still live outside the United States. How to fulfill that inner craving of being all together? “In-Culture” marketing can understand and address their needs. For example, Princess Cruises has tailored their accommodations and programs for this multigenerational family group. Additionally, they offer cruises that start and end at ports in Mexico and South America, allowing parents of Hispanic-American Boomers to more easily join in on the vacation. This strong emotional pull of intergenerational family bonds in Latino culture has deep implications for consumer product marketing as well. For example, Johnson & Johnson, when developing a new diabetes test kit, took into consideration that Hispanics tend to over-index with diabetes. Instead of positioning their Latino product message as “do this for yourself,” the marketing campaign communicated “address your health issues so you can be there and enjoy your kids and grandkids.” Appealing to this Latino deep emotional bond, sense of duty, and commitment to family legacy was a successful way to capture the attention of this valuable and growing consumer segment. Isabel Valdés, a pioneer in Hispanic marketing and founder of “In-Culture Marketing” heads Isabel Valdés Consulting, an In-Culture marketing consulting firm. Her extensive client list includes Fortune 100 and 1000 companies, nonprofit organizations and government. Ms. Valdés released her third book in late 2002, Marketing to American Latinos, A Guide to the In-Culture Approach, Part II (PMP, Ithaca, N.Y.). Presently she is working on a new book and sits on several boards, including Pepsi Co/Frito-Lay’s Hispanic advisory board, Scholastic, National Council La Raza, and the Latino Community Foundation. She is a frequent guest lecturer and public speaker in the United States and abroad. No marketing specialty firm can be an expert in all ethnicities, religions, genders, cultures, and generations. There is, in fact, growing recognition among marketers of the importance of insider expertise, coupled with an equally large and humble respect for any particular niche-specialist’s limitations. There are early indications of a trend toward the formations of alliances between cultural, gender, and generational experts, collaborating on marketing initiatives targeted specifically to meet this demand for increasingly sophisticated market segmentation. The sophisticated marketer, regardless of who the target market is, will want to know that there’s at least a minimal correlation between the cost of the offering and the financial resources of the consumer. But keep in mind that there are more contributing factors than simply the money in her bank account that makes one segment of the Baby Boomer woman population a more desirable target than another. More magazine educates advertisers about sub-segments within the Baby Boomer woman demographic, placing her financial status within an attitudinal context. In their recent Age of Mastery study of Boomer women, More revealed that those women with a higher average household income are not necessarily the most financially optimistic, nor inclined to value quality more than price. In other words, motivation and need can override household income when it comes to her purchase decisions. Along with gender, generational, and ethnic considerations, understanding her life stage drivers plays a critical role in making your product or service connect with her current life challenges. In Chapter Three we focus on the inherent opportunities for marketers as Baby Boomer women move through the complexity of various life stages. Excerpted from BOOM: Marketing to the Ultimage Power Consumer – the Baby-Boomer Woman by Mary Brown & Carol Orsborn, Ph.D. Copyright 2006 Mary Brown and Carol Orsborn. Published by AMACOM Books, a division of American Management Association, New York, NY. Used with permission. All rights reserverd. Copyright © 2006 Mary Brown and Carol Orsborn. All rights reserved.